As a boy, Damon Blackbourne was banished for faults his father failed to beat out of him. But when his father and older brother die in a freak carriage accident, Damon returns home to manage the family estate and introduce his teenage sisters into society, hoping only to keep his family secrets hidden. He isn’t looking for friends or fellowship. But Lady Grace Mattersley might change his mind. Today, please welcome author Margaret Locke to discuss her new book, The Demon Duke! Congrats on your new book! This is your fourth novel, but the first in a new series, right? Yes, it’s the first in my Put Up Your Dukes series, a Regency romance series without the magical elements present in my first three books. I’d still like to think the stories are quite magical in their own way, however! For lovers of Regency romance, many of the terms and locales will be familiar, but even for those new to the genre, my hope is the story pulls you in and doesn’t let you go. Should we read your first three books before this one? Of course! Ha ha ha, just kidding. A reader certainly doesn’t have to have read any of the Magic of Love titles to enjoy this romance; The Demon Duke stands alone. However, if people have read my first three books, especially book two – A Matter of Time – many characters will be familiar, as The Demon Duke’s heroine, Grace Mattersley, is the sister of A Matter of Time’s hero, Deveric Mattersley, Duke of Claremont. I always love seeing some familiar faces with each story, while also getting to know a new hero or heroine. What’s it been like for you? I love it! I’ve always loved romance series in which sidekicks from one book become the stars of future books. It invests me in the stories from the start, as I already feel acquainted with these people and therefore want to root for them. Plus, it’s fun to learn what characters from previous books are up to now. As an author, however, ensuring that you get all details consistent across books can be challenging! I’ve created a master spreadsheet for just that purpose, but still managed to make a cousin to The Demon Duke’s hero, Damon Blackbourne, a cousin to Grace as well – until luckily a beta reader caught it. Oops! Gotta love beta readers! You’ve described your genre as romantic comedy. Tell us about that. Actually, that’s my descriptor predominantly for A Man of Character, rather than my other two, A Matter of Time and A Scandalous Matter, which are time travel romances (though they’ve got funny parts, too!). A Man of Character gets the romantic comedy label because it’s not quite as traditional as many romances – and hopefully because it makes people laugh! “Romantic comedy” in romance has become in many cases a code word for “chick lit” – a genre name that has somewhat fallen out of favor. It refers to stories, usually humorous or “light,” that include romance, yes, but also have jobs or friendships or other elements equally prominent in the story line. A Man of Character has all of that – and more than one possible hero, which is not common in “pure” romance. Hence, romantic comedy! Do you have a favorite among your characters (or story lines)? Ooh. Good question. I love A Matter of Time’s Eliza James, because she’s so fun – winsome, bubbly, exuberant. All character traits I see in my daughter and which I try to cultivate in myself. As far as heroes, I love A Man of Character’s Ben Cooper because, well, he’s essentially my husband. But as for who has my heart and empathy? The Demon Duke’s Damon Blackbourne, hands down. Because I wrote him for my son. No spoilers here, but if readers read The Demon Duke’s author note, they’ll understand. What was it like to return to the 1800s for this book? Delightful and challenging at the same time. Delightful, because I love the Regency period. Regency romance has always been my favorite, so many of the places, events, customs, and much of the terminology is long familiar. But challenging, because now it’s on me to get those details correct. I’ve definitely learned it’s one thing to read historical romance, but quite another to write it. I’ve turned countless times to the Romance Writers of America’s The Beau Monde, a group of authors specializing in Regency romance, to ensure I’ve gotten the intricacies of titles right, among other things! When you started your first novel, did you envision the series taking this direction and possibly reproducing into more series? I’d always planned on writing Regency romance, so it was quite the surprise when the first idea that popped in my head and wouldn’t let go was not only a contemporary romance, but also one with paranormal elements. Say what? But that’s how A Man of Character was born. When I sketched out details for A Matter of Time, I gave Deveric Mattersley a large family with the clear intention of writing stories for each of the siblings. I assumed they’d all be part of my Magic of Love series – until I realized including Regency romances with no magical elements in a series renowned for them simply wouldn’t work. I needed a new series – and Put Up Your Dukes was born. However, not all Mattersley siblings are dukes or will marry dukes, so eventually I’ll need another series for the non-ducal stories. Plus, there are contemporary characters from A Man of Character and A Scandalous Matter who’ve been asking for stories, so again, I’ll need something for them that isn’t the Magic of Love moniker. And hopefully I’ll manage to do this all in ways that make the series enjoyable (and standalone) in their own right, but also delight and tickle readers that choose to follow me through all of them! Who are your favorite authors, and would you say they’ve influenced your writing and your chosen genre? One hundred percent, they’ve influenced my writing and genre. My top four are Julia Quinn, Eloisa James, Sabrina Jeffries, Sarah MacLean. They’re some of the biggest names in Regency historical romance, and I only hope someday to write as well, and with as much wit, as they do. There are so many more – Erin Knightley, Tessa Dare, Grace Burrowes, Lisa Kleypas, Shana Galen. I could go on and on. Julia Quinn is the author who brought me back to romance after a five-year hiatus (I had this silly notion that as a wife and mom to young children and as a woman in my thirties, it was time to give up my romance addiction. I was so wrong, and am glad I’ve recovered from that misguided notion.) I fell in love with her writing specifically for the witty banter and tension she infuses in each of her novels. Her Bridgerton series is much beloved, and for good reason. I definitely think the elements I love most about romance – the deep emotionality, the witty banter – influence my own writing, because they’re the two markers I hope stamp my own style. I guess I’ll leave it to readers to tell me if I’ve succeeded. What’s the most surprising question anyone’s ever asked you about your writing? Hrm. I’m not sure – though I did have someone suggest once I should write a sequel to A Man of Character in which all of the main characters had aged, maybe gotten beer bellies, cheated on each other, or acquired a number of other less desirable traits. I thought it was quite an odd suggestion, considering I write romance. Let’s just say I’m not keeping that in mind. What’s next for the series? Can we hope to see more familiar faces in the future? Next up in the queue is The Legendary Duke, second in the Put Up Your Dukes series, which is a tale loosely based on the Arthurian legend of Gawain and the Green Knight. Its hero is the Duke of Cortleon, referenced briefly in The Demon Duke. I also want to write the fourth in the Magic of Love series, tentatively titled A Delicate Matter, and then I’ve got The Once and Future Duke, The Irish Duke, and The Angel Duke to write for the Put Up Your Dukes series, plus A Matter of Chance, which is the story of Deveric Mattersley’s younger brother, Chance. Yeah, I’m going to be busy for years. But that’s good, right? Absolutely! And outside of novel writing, what’s next for you? This summer I’m attending the Romance Writers of America conference for the first time! I’m super excited – and a bit nervous. I’ll get to see many of the rock stars of the genre and meet a number of authors face-to-face whom I’ve heretofore only met on social media. I also have two signings coming up: The Fredericksburg Independent Book Festival on September 23, and The Virginia Writers Club Holiday Fest in Charlottesville in November. I’m looking for more opportunities like that – while also trying to balance personal life and personal needs. As are all women, right? A lover of romance novels since the age of ten (don’t tell her mom! ), Margaret Locke declared as a teen she’d write romances when she was older. Once an adult, however, she figured she ought to be doing grownup things, not penning love stories. Thank goodness turning forty cured her of that silly notion. Margaret is now happily ensconced back in the clutches of her first crush, this time as an author as well as a reader. Because love matters. The Demon Duke is available for pre-order at Amazon. Margaret Locke is on Facebook, GoodReads, Google Plus, Instagram, Pinterest, and Twitter. For more info, visit http://margaretlocke.com. Today we have a special guest — fellow Virginia author and friend Allison Garcia, in the first of what I hope will be many author Q&As, from time to time, at this blog. So tell us about yourself and your writing. What type of writing do you do? I write Christian fiction. Inside this genre I’ve experimented with a variety of subgenres, including speculative, mystery/thriller, children’s fantasy, and Latino. I really feel called to write Latino Christian fiction, and my book, Vivir el Dream, will be coming out on Amazon mid-May. My other favorite is my children’s fantasy series, called Prince Miguel and His Journey Home. When did your passion for writing begin? You have a new book coming out. What’s it about? Vivir el Dream is about an undocumented college student and her mother, trying to make their way in the world. It’s about their old and new struggles, the faith that keeps them going, and, of course, there’s a bit of romance thrown in for good measure. The subject matter is incredibly current to what Americans are (and have been) dealing with. Was it difficult to approach the subject of undocumented immigrants? Not really. I really feel like God was calling me to write this book by putting people in my path who have been through similar situations that my main characters experienced. As my job as a counselor, I have heard some pretty rough stories on why people take the risk to cross the border undocumented, the traumas they’ve experienced in their countries of origin, their hopes for their children. I have also been to several Virginia Organizing events, including rallies for The Dream Act. The power and courage it takes to stand up and fight for justice is overwhelmingly inspiring. We have also had several people in my church get deported, so I’ve seen first-hand how it breaks up a family and how unwavering faith has allowed them to trust in God’s plan in the midst of chaos. That’s what impacted me the most. What do you hope readers will take from Vivir el Dream? I hope my book gets people wrapped up in the beauty of Mexican culture. I hope it helps people understand why people come here undocumented and why things need to change. I hope other Latinos find their voice in this book and see their people represented as strong, loving, faithful, invaluable members of American communities. And I hope it shows how trusting in God and holding onto your faith can get you through some horrible circumstances. Though your book is in English, you also weave the Spanish language into dialogue and chapter titles. Could you tell us about that process? I wanted to make it authentic. I’m bilingual so it came naturally. I have loads of Latino friends, plus my husband is Mexican, so I especially know a lot about Mexican culture. I wanted the dialogue to represent how intergenerational Latino families interact. Juanita, the mother, came as an older teenager but never went to school, so Spanish was her primary language, and I wanted it to be represented accurately. Linda, the college student, is bilingual but there would be times she would need to say things in Spanish so her mom would understand. The chapter titles are all Mexican songs or movies or phrases used in Latino communities. In the end, my editor advised me that the Spanish was too advanced for non-Spanish speaking audiences, so I’m adding in footnotes for my English-speaking peeps. It wasn’t until I started using footnotes that I noticed how much Spanish was in the book. 400 footnotes and counting! You’ve written other books, too? Oh my, yes. Many. In terms of readable ones, I’ve got 4 adult books and 6 books in a children’s fantasy series. Prince Miguel is a children’s fantasy series that was inspired by a real life event, right? Yes, it was based on events after my son’s birth. In the hospital, I started writing a story and things just progressed from there. What was it like writing a baby (your son!) as a hero of his own book series? Weird, at first, because babies can’t do much, and I wasn’t sure how to represent how strong he must be and the journey he had to go through. In the end, my friend, Josette (wink, wink!) helped me decide to use a spirit animal to show the journey. So when Prince Miguel awakens for his journey, he is a turtle. How’s the series coming along? Do you have more books planned? I have 6 out of 8 books written. The first book is close to being finished while the others are still in early editing mode. I plan to finish the last two during NaNoWriMo this year. Many of your books were started during National Novel Writing Month (NaNoWriMo) — for which you volunteer as a Municipal Liaison. (As do I.) Would you share a little about your experience with NaNoWriMo? Oh, man. I love it! Previously it would take me years to write a book and I would be editing it the whole time and I was like a lone wolf. Then, I found NaNo and realized I wasn’t alone; there was an entire community of writers to help me through my writing journey. Plus I wrote a book in a month, so that’s pretty boss! Have you noticed a difference between writing a novel during NaNoWriMo and writing during other months? Haha, ever since I started NaNo I’ve only written during NaNo. The rest of the year is spent editing that book usually. What’s next? Publication? More projects in the future? Vivir el Dream is coming out mid-May. I have another Latino book, Finding Amor, that needs to be edited, plus the Prince Miguel books are nearly ready as well. So many choices! I’m also planning to translate Vivir El Dream into Spanish. Which other authors do you like to read? I love Barbara Kingsolver. I love classics like Jane Eyre, And Then There Were None, and Heart of Darkness. I love Harry Potter and The Hunger Games. I’m a sucker for diverse fiction, so I love Como Agua Para Chocolate and The Joy Luck Club and Beloved. So pretty much I’m all over the map. How can people find out more about your writing? I have a Facebook author page (https://www.facebook.com/allisonkgarciaauthor/) where I announce my books that are coming out. You can also check out my blog (http://allisonkgarcia.wordpress.com), find me on twitter (@ATheWriter), or look out for Vivir el Dream on Amazon mid-May! Allison K. García is a Licensed Professional Counselor with a passion for writing. Latina at heart, Allison has absorbed the love and culture of her friends, family, and hermanos en Cristo and has used her experiences to cast a glimpse into the journey of undocumented Christians. Flipping through the February edition of Better Homes and Gardens magazine, I happened upon the following advertisement for Secret deodorant for women. I’m not sure how I’m supposed to react to this ad, except to say how very disappointing I find it. 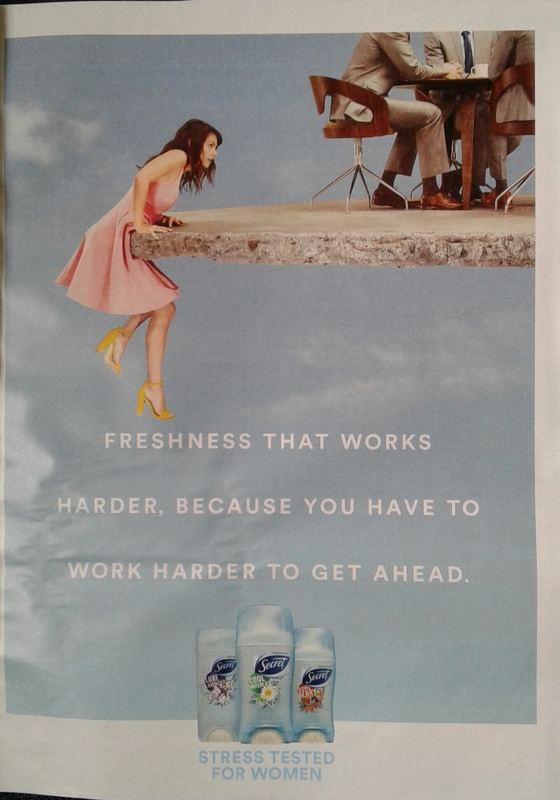 The pink dress, the 3-inch yellow heels, the implication that helping this woman smell “fresh” is Secret’s sole contribution to encouraging women along their climb to success… Where to begin? Yesterday, around the world, an estimated 4.8 million men, women, and children united in an effort to show that the opinions of women and other “minorities” matter in politics and in life. It was an astounding effort, much greater than most people seemed to expect. And although, nothing has actually been accomplished yet, the 673 marches are still symbolic of what people can accomplish when they decide to show up and unite their voices in a fight for equality and against injustice. That’s partly why this Secret ad was so disappointing to me. Not that I don’t understand what Secret was trying to achieve. It’s clear the company thought that by showing a strong woman literally climbing her way up to a new level of success, women would feel that Secret is supportive of their efforts in the workplace. However, I don’t understand why the company thought this woman needed to look party ready to convey that message. The three men at the table she’s attempting to join are dressed identically in standard grey suits and brown shoes. I want to know why she isn’t also wearing a suit and sensible shoes. Does Secret think we’re not going to identify her as a woman if she isn’t wearing a pink sundress? Again, I get what Secret was going for. It was trying to be understanding of how hard women have to work in the corporate world. It’s a well-known mantra that women have to work twice as hard as men to achieve the same success, which in itself is incredibly offensive, however accurate. So Secret isn’t revealing any secrets here; in fact I think it’s assuming we already know that women “have to work harder to get ahead.” But that’s also part of what’s so discouraging about this ad. It misses the mark of trying to make us believe that she’s worked twice as hard to get where she is. She’s arriving late to the table, and I would imagine if she’s really put in that much effort to get there, she would have dressed for the seriousness of the situation. I find this ad to be sad and self-defeating. The woman in pink, struggling to maintain equal footing with the men at the table, doesn’t really look like she belongs there, does she? She looks different from them in every possible way, and she goes unnoticed by them in her struggle to join them. And in 2017, that kind of advertising is not at all acceptable. We need to be telling women that they are every bit as worthy as men. Even if we know how hard their struggle is going to be and how long that road to success might take, we still need to give every assurance that women are on equal footing with men. The only way we as humans can achieve anything meaningful is if we can already imagine ourselves succeeding. And this ad doesn’t achieve that. It shows a woman’s struggle, not a woman’s success. I would have preferred to see an ad of a woman doing something to show she belongs at that table, something that shows she has the same skills the men do and can lead the conversation. Maybe she doesn’t need to wear a suit, per se, but how about something that shows she understands the concept of “dress code”? It would have illustrated her attempt to prove herself, but would not have separated her so distinctly by dressing her like a little girl trying to make it in a man’s world. Ultimately, I guess that’s what so offends me about this ad. It’s 2017 – a year in which 19 world leaders are women*, and a woman (Hillary Clinton) won the popular vote in the most recent U.S. election. Why are we still calling it a man’s world? * Based on January 2017 data from http://www.UNWomen.org.